OMRF has been awarded a quartet of new federal grants totaling $5.09 million. The grants cover a range of research areas, including colitis and colon cancer, sepsis, the development of new genomic tools for research, and outreach strategies for improved recruitment of minority patients for lupus clinical trials. 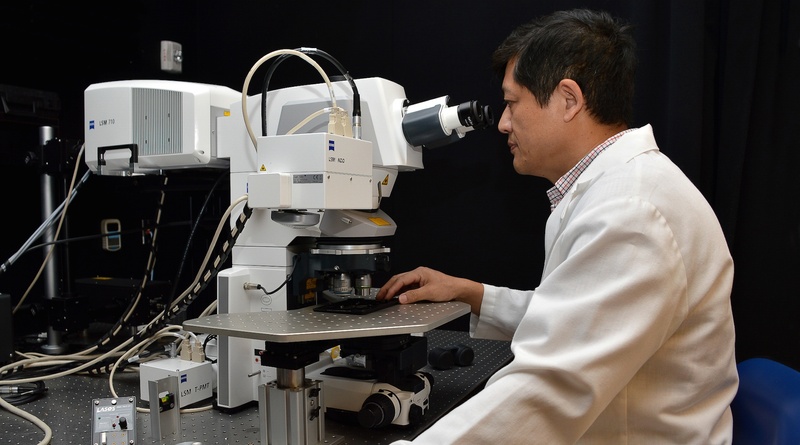 OMRF scientist Lijun Xia, M.D., Ph.D., received a four-year, $1.56 million grant (2R01 DK085691-06) from the National Institute of Diabetes and Digestive Kidney Diseases, part of the National Institutes of Health. The grant will support the study of O-glycans, a type of sugar produced by the body that comprises nearly 80 percent of a mucous layer lining the inside of the gastrointestinal tract. With a four-year, $1.4 million grant (1R01 GM121601-01A1) from the National Institute of General Medical Sciences, also part of the NIH, OMRF researcher Florea Lupu, Ph.D., will investigate a pathway called the complement activation system and its role in the deadly blood infection known as sepsis. Sepsis kills roughly 250,000 Americans each year and is the leading killer in the country’s intensive care units. The complement system, a part of the immune system, is vital to the body’s defense against pathogens like bacteria. But sometimes the system goes awry, resulting in attacks against the body itself. Lupu and his lab have found ways to inhibit the final stages of the complement activation system to prevent organ damage and cell death without impeding its positive role in removing pathogens and bacteria from the body. The Department of Health & Human Services has awarded OMRF physician Joan Merrill, M.D., a one-year, $525,000 grant for improving recruitment of minority patients to lupus trials through continued education to patients and healthcare providers. Merrill said the project includes initiating outreach efforts, developing patient materials, communicating with community representatives and training primary care givers on ways to appropriately disseminate information and establish effective communication with patients. The grant is specifically tailored for African-American, Native American and Hispanic populations. This communication-themed project will be measured at major lupus trial sites across the state. Scientist Gary Gorbsky, Ph.D., has received a three-year, $1.6 million grant from the National Science Foundation. This EDGE award—part of the Enabling Discovery through Genomic Tools program—will enable Gorbsky to continue his development of new tools to study the genomic makeup of different organisms. In particular, working with Marko Horb, Ph.D., of the Marine Biological Laboratory in Massachusetts, Gorbsky has found a way to generate and investigate specific genetic mutations in amphibians. The information they learn by studying amphibians like frogs and salamanders provides insight into vertebrate physiology and development that can ultimately be applied to human health and disease, Gorbsky said.